For Christmas, my mom and sis-in-law gave me a book I’d often heard them, and others, raving about. It’s called ‘Medical Medium’ by Anthony William. I’d listened, impressed, to Anthony on his HayHouse Radio show. His is a truly incredible story. Over the years he’s helped tens of thousands of people heal from illnesses and misdiagnosis doctor’s can’t resolve. How? By listening to a Divine Voice-Compassion- that literally speaks in his ear, down-loading the particulars of people’s pain and health. It sounds bizarre, but the proof is evidenced in his enormous notoriety and respect from everyone from medical fields to clients, his New York Times bestselling book and astonishing results in healing even people at death’s door, despite medical profession’s predictions of certain death. What I love about this book is that his healing modalities aren’t also bizarre, but all-natural solutions of a combination of raw fruit and vegetables and recommended herbs and supplements for ‘mystery’ illnesses such as ADHD, chronic fatigue syndrome, Lyme disease, hormonal imbalances, depression and a whole host more of dis-eases that affect our modern bodies and Beings. So if you, or a loved-one, suffer from any of the above mentioned or fibromyalgia, adrenal fatigue, Hashimoto’s disease, multiple sclerosis, neurological conditions, chronic inflammation, autoimmune disease, blood sugar imbalances, colitis and other digestive diseases I beseech you to invest in this life-changing book. My friends are getting sick of me talking about it so much…until they read it for themselves, and then comes the Aha moment! 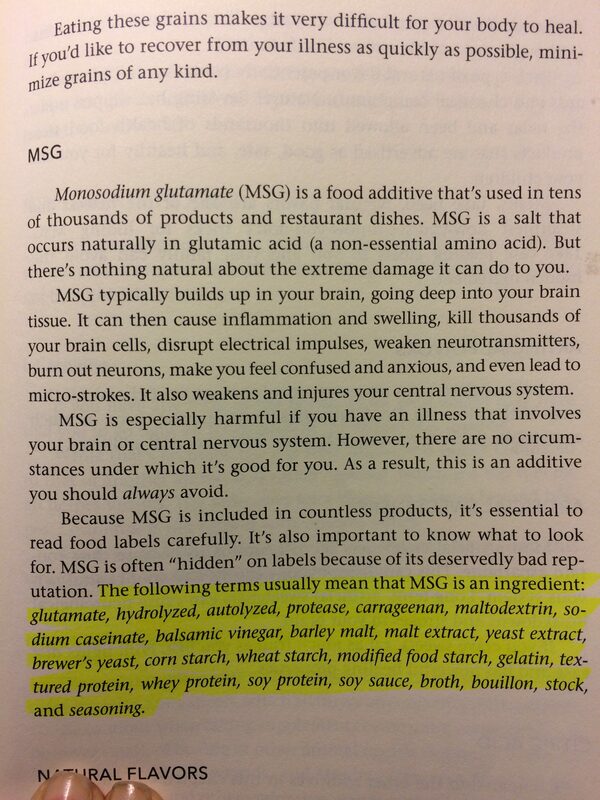 What I love especially is the chapter near the end entitled ‘What Not to Eat.’ As we chatted about in our last blog post, decoding misleading food ingredient labels can be cryptic, especially as they’re designed to dupe us into thinking we’re investing in a healthy product. For two months now I’ve followed the guidance outlined in this book. It’s highly empowering to be directly divinely guided when you’re making food choices. My body feels so clean and vibrant, as if my energy valve has been cranked up several notches. I also have a clearer head, less foggy, my productivity has risen and my skin is clear and eyes brighter. As a side, like most of us, sometimes I choose to ignore sound advice:-) Despite a healthy diet, and a shopping cart made up of 75-80% raw fruit and vegetables, I still enjoy coffee and wine (although detoxing off both currently) I still eat potato chips (albeit in coconut oil and not canola), and I’m probably not going to not eat the European chocolate my husband sources for me on occasion, naughty as it might be. In short, I’m human. I do the best I can, and every year my eating gets cleaner as I become more in-tune with what my body really needs, turning my palette off anything unnaturally sugared or salty. As long as my eating habits continue to improve, that’s good enough for me, at least all the time my body is healthy. Soy (according to Anthony-or his Divine Intelligence- GMO has destroyed both as a viable food). Canola Oil “…it creates a great deal of inflammation. It’s especially damaging to your digestive system potentially scarring the linings of both your small and large intestines, and is a major cause of irritable bowel syndrome. Canola oil can feed viruses, bacteria, fungus, and mold. Knowing this, I now buy Jackson’s potato chips which are cooked in coconut oil: Far less oily. Feel the difference for yourself. You can even make by thinly slicing potatoes (use a slicing disk on your food processor if you have one; far safer than slicing a wedge of your thumb off as I did when using a potato slicer on the side of a cheese grater:-) coating in coconut oil, seasoning lightly and baking for about 12-15 minutes at 400 degrees Fahrenheit. Personally, I love eggs far too much to avoid altogether, although I have lessened my intake to approximately 1-2 boiled eggs per week. (Again, this is ambitious for me, so I reduce instead of eliminate. I make smoothies with dairy free almond milk or coconut water and have cheese on occasion only). Farmed Fish…small, enclosed spaces they’re kept in often breeds parasites, algae and other diseases, so fish are treated with antibiotics and treat water with toxic chemicals, making consuming farmed fish risky. Gluten, can confuse immune system and trigger celiac disease, Crohn’s, and colitis. MSG: This is straight from the book. Highlighted is all the disguised pseudo MSG can lurk under. Take a snap shop of it and considered yourself forearmed. Under each of these foods to avoid in Medical Medium there is a lot more information, I’ve only plucked out what I see as significant sentences worth highlighting. In the meantime I hope this post helps you decode labels and make more healthful food choices. This entry was posted in Health, Nutrition, Pretty Fabulous People. Thank you, Malini, I’m so glad! Amazing information. Thank for sharing the great article.